Background: In 2015, Milton Keynes (MK) Council waste management team shows an increase in the numbers of abandoned used needles being found across MK. MK is an area of high Human Immunodeficiency Virus (HIV) prevalence and high Hepatitis C (HCV) in People Who Inject Drugs (PWID), the overriding concern was for the safety of the public. Methods: Analysis of data collection to understand the scale and spread of the problem, preventing/ reducing the incidence of abandoned needles and looking at access to the designated Drug Dependency Unit (DDU) and the Blood Borne Virus (BBV) service. Through data mapping, hotspot areas of used needles abandonment were analysed. Results: Peak needle stick finds were in March and June 2015 mainly in areas of social deprivation and marginalisation where designated needle exchange points were identified. 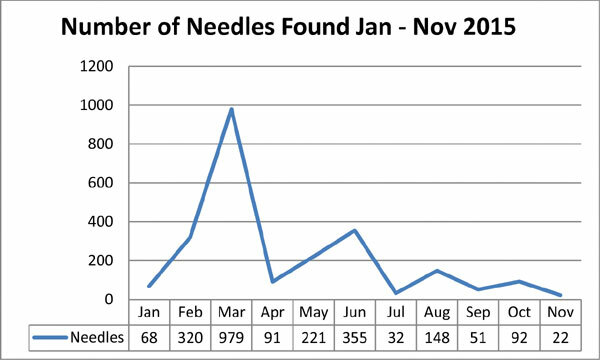 174 reports of abandoned needles were reported between January 2015 and November 2015 with a total of 2379 individual needles. 87% of the total numbers of needles were found in just 8 estates. Conclusion: Tackling the issue of abandoned needles effectively should be done through a targeted, multi-agency approach. Reductions in needlestick abandonment can be strengthened through improving access to needle exchange points, DDU and BBV services, delivering high-quality harm reduction interventions and using data mapping in order to identify and target hot spot areas. Injecting drug use, blood borne viruses, discarded needlesticks, marginalised cohort, Human Immunodeficiency Virus (HIV), hepatitis C.